Tango music has a long history in Japan. 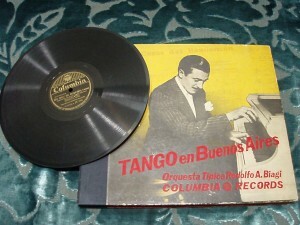 The first tango recording was released in Japan as early as in 1928, which was the recording of Orquesta Tipica Victor. And in the early 30s, Japan already had its own local orchestras playing tango music. After the Second World War, the trend of listening to tango music resumed, and continued all the way into the 80s. Nowadays, if you go to some second hand record stores in Japan, you can find tango music in all sorts of media – SP, EP, LP and CD. Some are originally released in Japan, some are imported from Argentina. With its long tango music history and many serious tango music collectors, Japan probably owns the largest tango music collections outside Argentina. And with its reputation of quality control and careful preservation, the tango records you can find in Japan are generally in much better condition than what you can find in Argentina. However, you need to pay much more to get them. One SP (78 RPM) and LP (33 RPM) in Japan generally costs from 1500 to 4000 yen (16 to 43 USD), while in Buenos Aires it only costs 5 to 20 pesos (1.3 to 5 USD). Same applies to CD. One Japanese CD costs 3000 yen (33 USD), while the Argentinian one only costs 20 to 30 pesos (5 to 8 USD). produced, manufactured and released by Japanese. 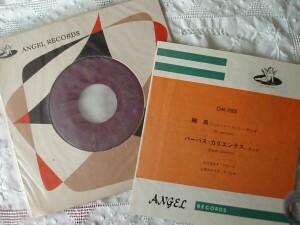 The first category is disc imported from Argentina and sold in Japan. Very likely these discs were brought back by Japanese who travelled to Argentina, and thus there are not many in the stores. And interestingly, these made-in-Argentina discs are cheaper than the made-in-Japan discs. For once, imported goods is not the most expensive. The second category played a significant role in tango music in Japan. Most of the record companies like Victor, Columbia, Music Hall and Odeon, either had their production lines in Japan, or released their music through a local record company. The result was the same, the music was made in Argentina, the disc itself was manufactured and pressed in Japan. Japanese subtitle and notes written by local music experts were also added to the disc to suit the local market. The quantity of this type of release is huge, it represents almost half of the second hand record stores’ tango collection. This type of recordings, including SP, EP and LP, shows how popular tango music was in the past. It represents the golden era of tango music in Japan. A set of 6 Biagi SPs with lovely cover, released in Japan by Columbia between 1940-1941. Tango EP issued in Japan, besides the titles, everything is written in Japanese. 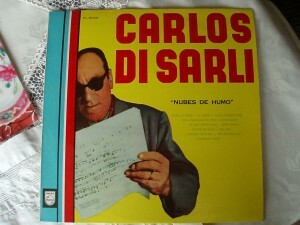 Besides in Argentina, Philips also released Di Sarli's last recording "Nubes de Humo" in Japan. The third category is well known outside Japan by tango music collectors. The tango CD series CTA (Club Tango Argentino) is the most famous among others. What people don’t know is, the trend of reproducing and reissuing tango music already started in the 80s by the same group of collectors who are now issuing CDs. In the 80s, these collectors took out their SP, EP and LP collection, carefully selected, cleaned, remastered and reissued the music in LP under their own labels. As their collections were huge and generally in good condition, and the production was serious, the LP was in high quality and usually contains rare recordings. The CDs we know now, are mainly reproduction from these LP, as the LP format died out in the 90s. Price wise, these discs, no matter is in LP format or in CD format, are the most expensive. Second hand CD or LP costs around 2000 to 2500 yen, brand new CD costs 3000 yen. There’s one thing I would like to mention here. Music lovers and collectors like to buy unofficial or bootleg tango CDs from collectors in Buenos Aires (I do the same). Because we want to get those few rare titles we couldn’t get in the official CD market, and these unofficial CDs are the only known source. I believe no Argentinian collectors would agree what I’m going to say here, but from my personal experience of buying tango CDs both in Buenos Aires and Japan, I believe many (if not most) of the unofficial tango CDs we can find in Buenos Aires are just copies of the Japanese labels. Why I said so? If you would have two CDs, one is this unofficial Argentinian CD, one is released in Japan, and both shares exactly the same number and sequence of songs, the songs have the same sound quality and duration, I’m sure you would wonder too. Plus I have few bootleg CDs I got in Buenos Aires years back which even printed out the original covers of the Japanese discs. I’m not intended to blame these pirate CDs, even though generally I was disappointed by its quality, I benefit from these pirate CDs as they are still the most available source to get rare titles. What I’m trying to say is, the Japanese collectors actually contribute a lot to the preservation of tango music. We don’t see or know them, but without their effort, we won’t be able to enjoy so many good tunes. Many of us won’t have much chances to buy the original Japanese tango CDs, but if one day you have a chance to do so, buy one. Yes, it is expensive compared to other tango CDs on the market, but don’t forget the effort and the spirit behind the CD, it worths. This entry was posted	on Thursday, September 24th, 2009 at 10:06 pm	and is filed under Music. You can follow any responses to this entry through the RSS 2.0 feed. You can leave a response, or trackback from your own site.